Just back from attending the Grace and Truth Ministries 1st Annual Oregon Conference in Salem, Oregon, taught by Pastor Joseph Sugrue of Grace and Truth Ministries and Pastor John Farley of Lighthouse Bible Church in Florida. Both men were mentored, trained and ordained by Pastor Robert McLaughlin of Grace Bible Church Somerset Mass, and now have their own congregations in Oregon and Florida. It was an incredible trip and conference, maybe the best ever for me, despite how discombobulated I was. SOOOO much happened during those 5 days that my introvert brain was — and still is — on overload. At times I felt like pieces of me were flying off in different directions. I never seemed to know where any of my stuff was. Where was my camera? The rental car keys? My purse? Where did I put my comb? My Bible? The sunglasses clip for my glasses…? Yes. Doing that very thing I just mentioned of going back to a place you know full well you already looked in and found nothing. Well, it was late… And I was exhausted. And sleep-deprived. And, as I said, overwhelmed with input. I need time to process it all, and so far, it’s been a continuous stream of input. As it turned out, I didn’t need a single one of those papers. And losing the sunglasses will finally force me to make an appointment with the eye doctor that I’ve put off for almost 2 years now. So, even in that, everything is just fine. 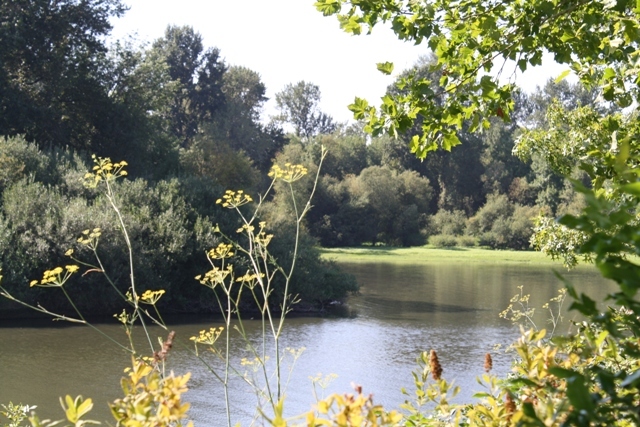 This entry was posted in Conferences, Photos and tagged Bible conferences, Oregon, Photos, river on August 27, 2012 by Karen Hancock.